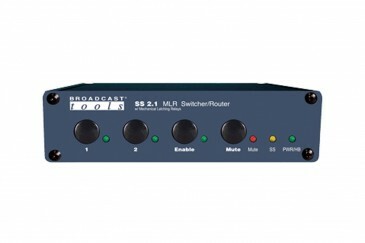 The SS 2.1 MLR/TERM is a transparent two input, dual output switcher/router with mechanical latching relays. The SS 2.1 MLR/TERM is perfect for all types of passive signal switching via front panel switches, contact closures and/or serial RS-232. The switching is accomplished with mechanical latching gold contact relays, which means that the unit can route a signal in either direction. Due to the passive nature of the switching, any input level and impedance can be used. Inputs may be balanced or unbalanced, while output levels, impedance, distortion, noise and balancing will match that of the selected input. The SS 2.1 MLR/TERM can be controlled and monitored locally and/or with simple contact closures to ground, as well with multi-drop RS-232 serial commands. - Remote control via contact closures, 5-volt TTL/CMOS logic levels and/or the multi-drop RS-232 serial port. TCP/Telnet control/monitoring with our optional ESS-1, RS-232 to Ethernet adapter. - Two SPDT relay outputs for remote channel status. - Internal silence sensor with front panel LED indicator; separate SPST silence sensor alarm relay, adjustable alarm delay and restore duration. - Audio/signal switching via mechanical latching sealed relays utilizing 2-form-C bifurcated - crossbar silver alloy with gold overlay contacts. - Removable euro-block screw terminal connectors are used for audio/signal I/O and remote control connections. Necessary mating plugs are supplied. - The power-up source selection feature allows the user to select which source is active at power up, including the last source selected. - If power is lost, the last selected channel is passed to the output. - Surge protected internal power supply, domestic power supply provided. Optional CE 240 Vac 50-60 Hz power supply available. - Up to three units may be mounted on the optional RA-1 rack shelf. Desk top and wall mounting is also possible.